Old Spice helps answer those awkward questions from your tween boys! Once I regained consciousness got up off of the floor, I explained to him that it was time to start wearing deodorant. Every. Day. The weird thing is, that smell came out of no where – one day he didn’t smell and the next day he did. He’s an active kid and now that his body is changing, he’s sweating a lot more. The thing is, having those “awkward” conversations can be tough sometimes. Especially when it’s a mom having to bring up topics related to puberty to their sons. I am a boy mom and while I tried to make it as light-hearted as possible, it was hard for me to say the words “You are starting to grow into a man and you need to start wearing deodorant every day now”. And once you start talking about why it’s important to bathe and use deodorant every day, it leads to other topics like oily skin/acne and hair growth (and I don’t mean the hair on their heads!). When it comes to puberty, I have always felt like girls take front and center most of the time. I’m a girl, or at least I was once, and I have first hand experience with the changes us ladies go through. But when it comes to puberty in boys, it has always seemed to have been downplayed a bit more. Until now! 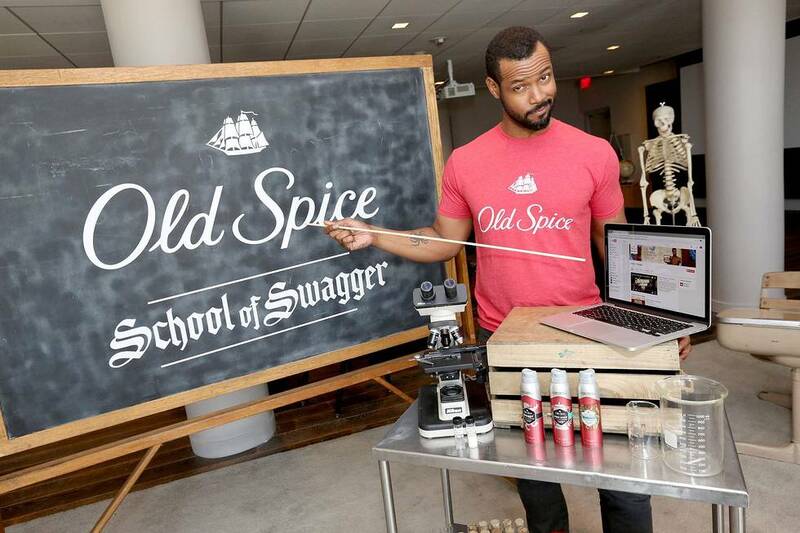 Introducing the NEW Old Spice School of Swagger, an online, video-based puberty curriculum. Old Spice has been helping guys navigate the seas of manhood for nearly 80 years, so it’s pretty safe to say that they “get” guys. To help, world-famous Old Spice Guy Isaiah Mustafa is back to say, “Hello, Puberty!” The four-part edutainment video series covers awkward topics guys face as they enter puberty, from that funky new smell to hair growth and oily skin. I had a chance to meet Isaiah at the School of Swagger launch event. At the event I also learned lots of fantastic information from Jaime Stahl, the Old Spice Sweat Scientist. Jaime is a Chemical Engineer by degree. She spends her time as an Old Spice Sweat scientist developing technologies to meet men’s personal care needs. You guys, Jaime is legit! I learned all about the science behind what you see in the videos. Speaking of the videos…here is the introductory video in the series. The rest of the videos in the series can be found at schoolofswagger.com! If you have tween boys, I highly recommend watching them. They are fun and most importantly, educational. We’ve tried them all and Hawkridge has definitely won out as the favorite scent here in our house. 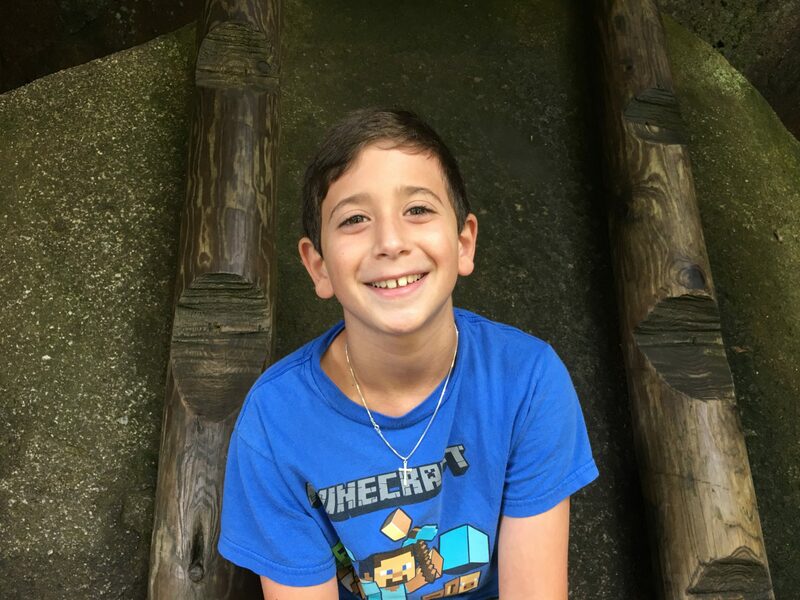 My youngest son just turned 10 (OMG – double digits!!!) and is going to be experiencing those changes real soon. My boys, husband and I sat down and watched the videos together and while my oldest pretended not to be interested (even though he clearly was), my little guy hung on every word. He has seen his big brother starting to experience changes with his body, so he knows his turn is coming up. I love that these videos provide a good explanation as to why the changes are happening, what to expect as they happen and that they are done with humor. I also wanted to mention Old Spice’s new eGuide “The Struggle is Real: A Wild Guide to Growing-Up for Moms & Sons” (available for download here). It’s designed for moms and sons and they’re sparking conversations by sharing some hilarious (and shocking) new national mom/son study findings. In the guide, you will also find some really helpful tips from popular parenting expert and mom of 4 boys, Deborah Gilboa, M.D. (aka “Dr. G”). I had the chance to sit in on a conference call with Dr. G. while I was at the launch event for the School of Swagger and learned so much! One of my main takeaways from the conversation with Dr. G. was that often times boys don’t even realize their underarms smell. Our brains are programmed to ignore our own smells since we use our sense of smell to seek out danger. Makes sense, right? That’s why these awkward conversations are completely necessary and thankfully the new School of Swagger videos are here to help! Another thing I learned was that shampooing regularly actually helps reduce acne! How about that? Shampooing regularly washes away the bacteria, hence less acne! Talk about a good incentive to stay clean. Dr. G. explained how kids are all about the “why” (which I think a lot of us have already figured out), so the new Old Spice videos aim to answer their questions by providing simple and easy to understand language – and most importantly, they’re hysterical. Kids, especially boys, respond well to humor. Before I send you off to go watch all of the new Old Spice School of Swagger videos, I want to leave you with this: When it IS time to have the harder talks with our tween boys, DO NOT do it in front of other siblings. Make sure you have them alone without distractions (such as siblings) to ensure you have their attention. Now, off you go to the School of Swagger with you…. I love this so much. My husband and son both use Old Spice, and they smell great. That’s important, because boys of any age can get stinky! I will need to have that talk with my kiddo before too long! He is just about to that stage! I can’t believe these kids are growing up this fast! We love Old Spice and I have a son who is having these same issues and is starting to need those products. We liked the Bearglove the best but liked them all and will switch different fragrances. I think it’s really cool that Old Spice is making videos to help educate on the different changes. Also love the eguide for moms and sons because we all know the conversations can be a little awkward. Old Spice has a great product line. My favorite is the original scent. The deodorant is the only kind that works well for my husband. I know its hard having that conversation with Tweens. But sports does it! Old Spice has totally revamped and the next generation loves them. That’s pretty awesome! B.O. really does seem to come suddenly as the kids grow up! The School of Swagger is such a cool idea! It will definitely help! Your story about “boy smell” made me laugh. You def. took the right approach. The different scents will appeal to any young man. OMG I have to show this to my almost 12-year-old son. We need to have THE Talk and I need him to teach him what to do. Great tip about shampooing the hair! I was just reading about this earlier today. This rule kinda goes for girls too, but we never seem to put the same emphasis on personal care with boys. I’m so happy to hear about campaigns like this for kids like my adorable tween grandson and your super cute tween. When did they get so old?!! That’s a great way to introduce good hygiene to the boys especially since they’re more active and they sweat a lot, I’m sure Old Spice is the perfect solution for that! I love that they are focusing on boys who will be using these products for the first time! I love this! I remember when my son first started wearing cologne and other such things. What a great way to get young men started. Well done, Old Spice. I know in a few years I’ll be dealing with this! My son is 9 years old. My son likes to put a spritz of guy cologne every once in a while. I cannot believe your kids are already super grown! Gosh, I remember when they were mega young looking on the blog! I am SO not ready for the teenage years! 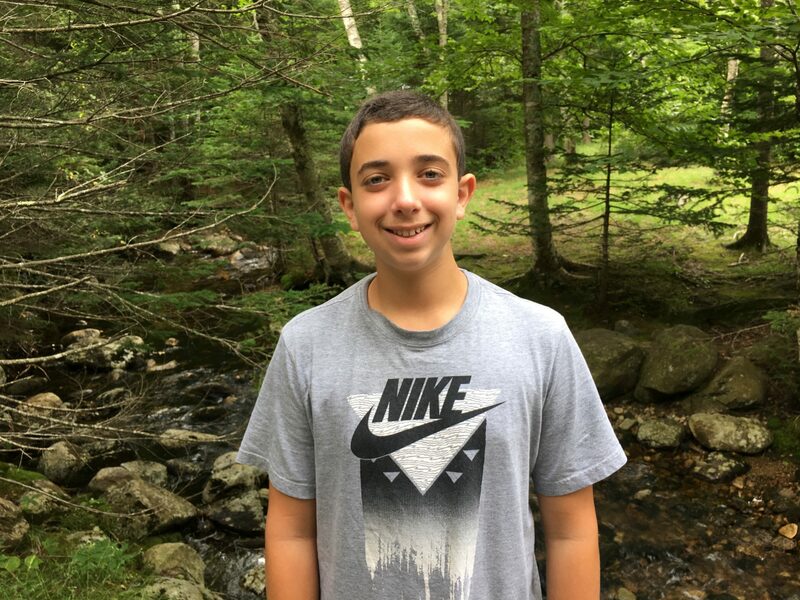 The website seems like a really great resource for tween guys! This is perfect timing. 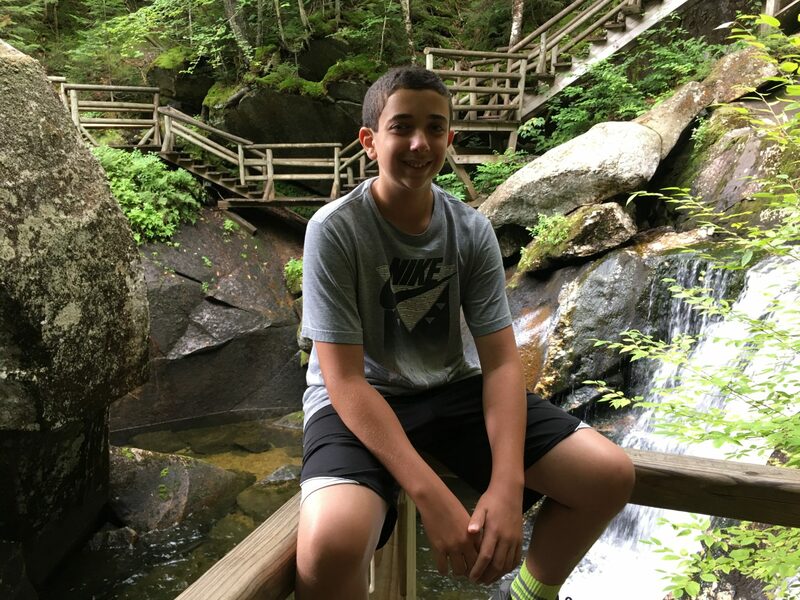 My son’s body has been going through changes and I don’t know how to approach some of the subjects. I watched the intro and my son would watch these videos. I like that they have a sense of humor about them. My girls aren’t quite teens yet, but I bought them deodorant. No one wants to sit next to the smelly kid at school. Your little man looks like the perfect companion!. I have to admit I don’t know too much about Old Spice, but it sounds like they are really trying to bring it up to date for the younger generation. Old Spice has come a long way since my dad used to wear the stuff from the white ceramic bottles. I have daughters, but when my now 18 year old daughter was about that age we had a similar talk. I love the smell of Old Spice. This looks like it was such an awesome event for you! All of my sons are around the same age and so when it was time for the talk, it was a family event. Sidenote: Isaiah and Terry are the funniest Old Spice guys and their ads always have us laughing. Funny how one day they just start smelling and time for the deodorant. Nice to make light of it at first and explained time to start using it everyday. Next will be getting him a shaving kit. my son is turning 9 and I have already noticed he is changing a lot. Old Spice would be great for him to try! My son is almost ten and can knock me down with smell after soccer! He loves the swagger line it makes him feel more manly he says! I’m thankful that my guys are still a little too young to really bowl me over with their lovely smell, but I know it’s coming and being a boy mom … I know I’m in for it 😉 Sounds like you learned a lot about Old Spice! This is so cute and great idea for young boys. Everyone needs some swagger and who better than the Old Spice man to teach it? :-). Your boy is so cute too . I have 3 girls, one of which will be a teenager in a few short weeks. My girls needed deodorant a while ago and I make sure they wear it every day! My boys are going to appreciate this new line that’s totally focused on their age group. I like that Old Spice is promoting good hygiene! We’ve tried a number of the Old Spice products including some of the Swagger scents. I haven’t seen the Krakengärd yet, will have to watch fo that one so I can check it out. having a new baby boy this is actually something I’ve thought about. I know NOTHING about boys and this will come in handy! I’ve always been a fan of Old Spice products! I have a teenager too, and he has to use lots of deodorant! I’ll have to check out that eGuide. I remember my mom saying, “Boys stink.” Hence why she always made sure my brother was on top of his hygiene. She didn’t mean it to be unkind, it was just a fact of puberty. Love this new idea from Old Spice. Oh my little stinks and he isn’t a teenager. I love these products! I have a 15 year old so I hear ya…all of a sudden he is showering regularly…lol. He does NOT want to talk about anything concerning puberty. I have two younger brothers. Teenage boys can be ridiculously stinky at times! Old Spice makes such awesome products! I didn’t know that shampooing reduced acne! Puberty is definitely a tricky subject to broach, especially with boys. I am not ready for my little guy to ever need cologne. Stay a baby forever! I swear every male in my family wears old spice. Very popular coming of age product. These videos are really nicely done and will come in handy. Us dads don’t particularly like chatting about this topic with our sons either. Anything to make the conversations easier is appreciated. This is an adorable campaign, it’s funny and I love that Old Spice is bringing their brand back swinging like this! I can’t believe your son is 13 either, OMG! They grow up so fast. I remember the day my boy started stinking as well. Whew! We LOVE Old Spice in this house. Teen and tween boys definitely need to be reminded about hygiene! I remember those days. My son is almost 20 now! The teen years will pass quickly. Enjoy them! Ah, yes, that good old boy-becomes-man smell… LOL It’s nice that Old Spice has the answer with the School of Swagger! This is really great. My oldest well, if he doesn’t overload himself with deodorant and such oh man those boy smells! I’m going to be picking him up some Old Spice products before school starts! This is great! MY husband uses Old Spice, that’s the only brand he likes. Time flies, I have another year then I will have a teen as well. Hahah I love these! I need to have my son watch them. He hasn’t reached the level of stinkiness just yet but when sweats P-EWW!! such a great initiative to help teenagers in puberty and of course smelling awesome! I think it is awesome that Old Spice is helping moms of boys and providing tools to talk about puberty. Love the fact about shampooing your hair to help with less acne. There are the kinds of things that help kids understand. Parenting become tougher when your kid enter in teenage. Patience and understanding is necessary. My dad and grandfather used Old Spice After Shave. I am glad that there are more Old Spice products that my husband and sons can use so they will always smell clean and fresh! Sounds like an amazing product. I helped run a high school camp and know first hand how important it is to have the right products. Old Spice looks really promising. I love that old spice is trying to target a different generation than the mature man. It is a great man smell. We had to switch Mica’s deodorant recently. It was a natural one, but it just wasn’t doing the job. Old Spice is what we switched him to.